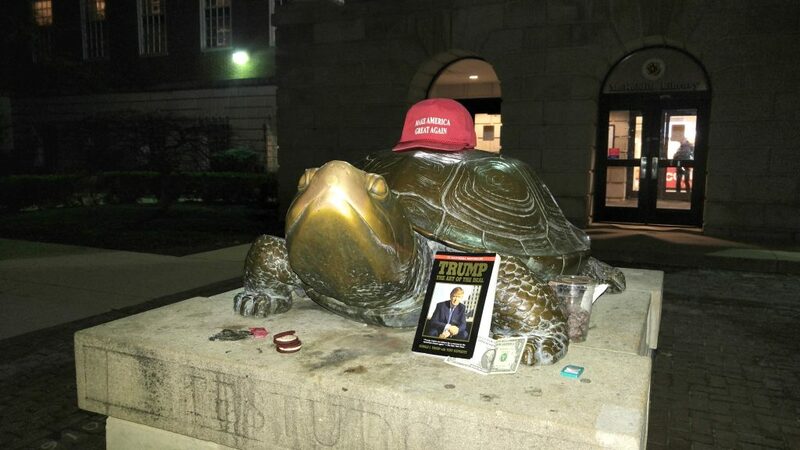 On the University of Maryland’s College Park campus earlier this spring, Republican presumptive nominee Donald Trump had an unusual campaign surrogate: A statue of Testudo, the university’s turtle mascot, was decked out in Trump regalia, with a dollar bill at his feet and a red “Make America Great Again” cap perched on top of his shell. Taking credit for the display was a small but growing band of passionate college students, a group called “Terps for Trump.” But unlike their mascot, some of these students are reluctant to display their support loudly on campus. And they’re not alone. Their uneasiness stems from a social stigma that many supporters of the brash business mogul say they face on college campuses and in other public spaces. Their uneasiness stems from a social stigma that many supporters of the brash business mogul say they face on college campuses and in other public spaces. Trump supporters have the reputation of being as loud, bombastic and controversial as their candidate, but in some corners of the public sphere, they feel they must keep their stances quiet. Shubham Chattopadhyay, a freshman engineering major, is vice president of Terps for Trump. At first, he didn’t proclaim support for the candidate publicly at all. He didn’t talk to reporters about Trump or post about him on social media. And he’s still hesitant to wear a Trump cap or T-shirt on campus. But, he said, the Terps for Trump club has become an enclave for Trump supporters on the mostly liberal campus to gather and discuss their ideas. And he’s learning to face opposition from his peers. READ MORE: Could Trump obliterate partisan politics? Much of the backlash has surfaced on social media, such as when Patrick Ronk, student body president before he graduated in May, spoke out against the club on his personal Twitter account, calling it “deplorable.” Ronk did not respond to a request for comment. The club’s Facebook page also got banned from some of the UMD class Facebook groups, said founding member Brian Mulligan. “[Opponents] kind of like to stay behind their computer screen,” Chattopadhyay said. Matt Morris, the club’s president, said he’s not worried when he sports Trump gear on campus. Sometimes he gets compliments or messages of support, he said. Other times, reactions vary from smirks to scowls. The group members often write messages supporting Trump in chalk on campus sidewalks, a phenomenon known as “chalking” that has spread wildly among college campuses and has stirred controversies over campus free speech, particularly at Emory University, where students of color said they felt targeted by Trump supporters, given the candidate’s insensitive comments about race. Megan Pohl, vice chair of the group, College Republicans at Georgetown University, said her school has also seen “chalking” incidents. It’s hard enough to be vocally conservative on campus, she said, citing incidents where conservative students had door signs destroyed and dorm-room doors scrawled with obscene messages in permanent marker. On April 15, The Terps for Trump club held a debate with the Terps for Bernie group on UMD’s campus, drawing a crowd of about 150 to 200 people. But the event left students feeling entrenched on opposing sides, Morris said. “I don’t necessarily think that we facilitated civil discussion of our ideas as much as we would have liked to, because it was very polarized,” he said. Much like the Republican Party as a whole, Terps for Trump has numbers on its side — a typical meeting hosts 14 or 15 students, slightly more than the College Republicans group typically attracts, Morris said. But Terps for Trump lacks the official stamp of approval from Republican student leaders. Terps for Trump doesn’t have a faculty adviser yet, which it needs in order to get school funding, and the College Republicans — who couldn’t be reached for comment — have kept their distance, Morris said. The UMD Progressive Republican Club has also spoken out against Trump and his supporters. Bobby Lindsey II, a 2016 graduate and former president and co-founder of the Progressive Republicans group, said he started the club to give socially moderate Republicans an inclusive space on campus. “We felt that Republicans needed to work a bit harder at broadening their tent and including people of different walks of life and different backgrounds,” he said. The group wasn’t launched in direct response to Trump’s candidacy, but it has clashed with Terps for Trump members, especially on social media. The Republican infighting on campus echoes similar splintering within the national GOP, Morris said. “A microcosm of the Republican Party is playing out on campus,” he said. Chattopadhyay said Terps for Trump has come a long way in gaining social legitimacy — especially in conservative-leaning circles like the business school, the engineering department and fraternities. Mulligan helped start the club so Trump supporters would feel comfortable meeting on campus in what could be seen as a hostile environment. But, the members said, there’s still a lot of work left to do. “If people were a little bit less afraid of ‘coming out’ as a Trump supporter, we could have a huge legitimate base on campus,” Chattopadhyay said. 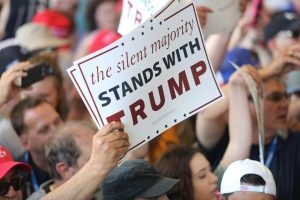 College campuses aren’t the only place where Trump supporters face a stigma among their peers. Even in deep red corners of the voting map, Trump voters are afraid to speak out. 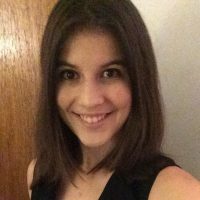 When Jessica Hullings volunteered for Mitt Romney’s campaign in 2012, no one in her hometown of Stoneville, North Carolina, batted an eye. But in this election cycle, Hullings, who supports Trump, has kept her political views to herself. Hullings, a 23-year-old stay-at-home mother of two, lives in a community that would seem ripe for Trump votes. Rockingham County, nestled in a rural swath of foothills on the Virginia border, was a small but thriving textile hub until the recession laid waste to its mills and factories. Its residents are mostly white and working-class. And now, many of them feel left behind by an economy propelled by automation and higher-tech factory jobs. But with most of her neighbors supporting Ted Cruz, Hullings said she felt uncomfortable expressing support for Trump. Churches are the center of her community. Trump’s populist message has attracted some evangelical Christians, but his campaign shies from the hard-line social conservatism that Cruz embodied. For example, Trump has shrugged at the controversy over North Carolina’s new transgender bathroom restrictions, saying transgender people like Caitlyn Jenner can use the bathroom of their choice at Trump Towers. The wife of a Bernie Sanders supporter, Hullings is no stranger to bipartisanship — and, she said, Sanders and Trump are drawing support for similar reasons, like frustration with economic downturn. But even in a conservative hotspot, supporting Sanders ignites less controversy than supporting Trump, she said. “I’m afraid of getting hateful comments, being called ignorant, uneducated, racist, homophobic when I’m not,” Hullings said. Now that Trump is the presumptive nominee, the stigma has softened somewhat, Chattopadhyay said.